Kotzen explains his custom Fender models, signature Victory amplifier, and DiMarzio pickups of choice. Watch Def Leppard’s Phil Collen demo the DiMarzio Super 3, HS-2 and Super Distortion S pickups. In this new video, Steve Vai discusses developing the Dark Matter 2 pickups –the result of his collaboration DiMarzio. In this new clip from DiMarzio, Def Leppard axeman Phil Collen shares his love for the company’s Super Distortion humbucker. In this brand-new clip that was posted over the holiday weekend, guitar legend Steve Vai demos and discusses his new Dark Matter 2 Neck, Middleand Bridge pickupsfromDiMarzio. Here’s a new clip courtesy of DiMarzio featuring Periphery axeman Jake Bowen playing the Titan 7 neck and bridge pickups. In this new video from DiMarzio, we check in with Dave Davidson and get an introduction to some pickupsdeveloped specifically for the Revocation guitarist—the Imperium 6 and Imperium 7. Here's a brand-new video from Dimarzio featuring guitarist Antoine Dufour.In the clip,Dufour demos and discussesDiMarzio's The Black Angel Piezo and Magnetic Pickups. Steve Vai and DiMarzio have teamed up to create the new Steve Vai Signature DiMarzio Cliplock guitar straps. The straps feature original artwork created by the guitar virtuoso. In these brand-new videos, guitarists Mike Dawes and Jimmy Wahlsteen demo and discuss DiMarzio's The Black Angel acoustic soundhole pickup. Below, check out a new video posted by the crew at DiMarzio. It features Animals As Leaders guitarist Javier Reyes, who demos and discusses the custom DiMarzio Eclipse 8 pickup. 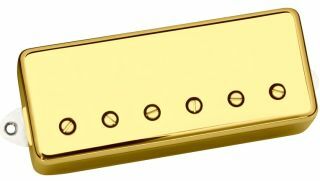 "I was making a video for DiMarzio pickups recently, when I felt a sudden urge to make a 'public service announcement' about rock-and-roll strap length."